December 10 2015. 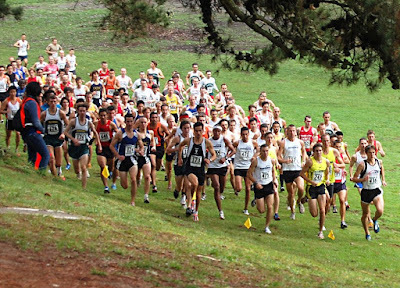 Nearly 1000 Masters runners are entered in the USATF Masters Club Cross Country Championships to be held in San Francisco this Saturday, December 12th along with the Open Championship. The race is hosted by the USATF-Pacific Association with the course located in Golden Gate Park where many national cross country championships have been held. Because of the large number of runners entered, there are three separate races for Masters Runners. The Women go off first at 9:00 AM over a 6 kilometer race course, followed by the 60 and over Masters Men who start at 9:45 on an 8 K course. Finally the 40-59 Masters Men race at 10:45 over 10K. Rain is forecast for Thursday evening and overnight into Friday, sometimes heavy. But it is forecast to clear up for Friday during the day and remain dry until Saturday afternoon. Conditions should be very good, apart from the risk of a soft course which might lead to muddy sections. Temperatures are forecast to be in the mid-50’s with little wind. Men’s 40+ Teams. Four of the best teams come from the Northeast, the Pacific Northwest, Southern California, and the South. The BAA is led by veterans Chris Magill and Pete Hammer; defending champion, Greg Mitchell and the Baumann brothers headline the Bowerman Track Club entry; Jerome Vermeulen and John Gardiner who finished a close 2nd and 3rd to Mitchell at the USATF Masters Mile competition in August will try to hang tight in the pack up front for the Cal Coast Track Club; Kristian Blaich, 3-time Masters road champion this year, will join Chad Newton and Alan Black for the Atlanta Track Club. And no one should count out the home team, the Asics Aggies. Clint Wells, the winner of the USATF Masters Marathon this year will spearhead the Boulder Track Club’s effort. Bowerman Track Club, Atlanta Track Club, Cal Coast Track Club. Men’s 50+ Teams. Five of the best are the Cal Coast Track Club, Club Northwest, the Genesee Valley Harriers (GVH), the Greater Springfield Harriers, and the Playmakers Elite/New Balance. Cal Coast wishes that Pete Magill’s rehab year was already over but Rob Arsenault has just aged up into the 50+ group and will try to lead their strong group to victory. Club Northwest is the defending champion and they bring their team back intact, led by Joe Sheeran. Last year the GVH team and the Playmakers Elite had the same average time and were separated in the scoring by a single point, with Playmakers making the podium and Genesee just off. You know how much Genesee wants to reverse that. 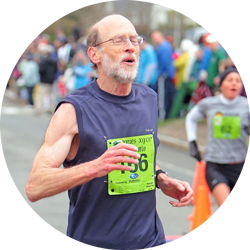 Since last year Playmakers Elite has added Dave Bussard who has taken M55 wins at the 1 Mile, 5K, 12K and 15K road championships. But Mike Nier aged up into the 50+ division since last year so it should still be a barn burner of a race between those two teams. I will give the edge to Playmakers as I think they will have a slightly tighter pack which makes more of a difference in big races. And the Greater Springfield Harriers will be more competitive this year. Francis Burdett is rounding into shape again after a terrific start to the year and then a bit of a lull. Nat Larson, a new team member, has been running strong all fall with M50 road wins at the 5K and 15K. Club Northwest, Cal Coast, Playmakers Elite. Note. USATF decided to end a 2-year experiment this year and returned to the former rules for M60+ and above teams. Scoring is the sum of the finishing places of the first 3 runners. In 2013-2014 they used the top 5 runners on each team for all age groups on the Men’s side. Men’s 60+ Teams. Last year this was one of the closest races with only 7 seconds separating the average team time of the first four teams. But things have changed; last year’s second place team, Ann Arbor Track Club is so banged up they will not compete. Last year’s winning team, the Atlanta Track Club, has been weakened by the departure of their top runner, Kirk Larson, who is now running unattached. That should mean the clubs who finished 3rd through 5th, the Cal Coast Track Club, the Shore Athletic Club (Shore AC), and the Genesee Valley Harriers, should be slugging it out on the course. But the favorite is actually the Boulder Road Runners who did not compete last year, but took titles earlier this year at the USA Cross Country Championships and swept the team titles on the roads at the 5K, 15K, and 12K this fall. If John Victoria, Doug Bell, and Devin Croft are fit and healthy, they should take the title. Cal Coast brings back the same team except they have added Dale Campbell who can typically be counted on for a podium finish, improving their odds. Shore AC is always tough and their lead runner, Reno Stirrat has been running very well of late. Two other clubs might be in the hunt, in large part because of including a top runner on their team. Club Northwest, led by Rick Becker, could be a factor. He took the M60 title at the .US National Road Race. The second place finisher at that race, and winner at the 1 Mile, 5K and 15K road races this fall was Tom Bernhard. With only 3 scores counting, Becker and Bernhard could make a big difference for their teams. 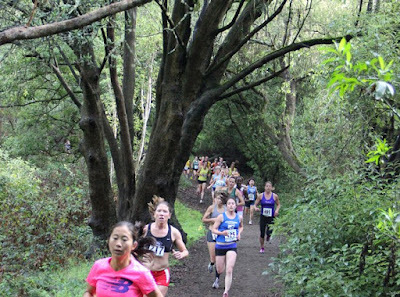 Boulder Road Runners, Club Northwest, Cal Coast. Men’s 70+ Teams. In years past one could confidently pencil in the Ann Arbor Track Club at the top. But newly minted Hall of Fame Runner, Doug Goodhue, is banged up and taking time for rest and rehab. Last year he got injured during the race and Shore AC followed Przemyslaw Nowicki’s lead to take the title. But this year it appears Nowicki will run with the 60+ team and Shore is not even entered in the 70+ race. The Atlanta Track Club, led in 2014 by Ed Bligh and Ron Mastin will try to elevate their game and change their 2014 silver trophy to gold. At the .US National race last month, two of their new runners, Frank White and Morris Williams, finished ahead of Bligh so their team is stronger. They finished a close 2nd to Shore AC in that race but will not have them to worry about here. But they will have a local team to worry about. The Tamalpa Runners have two very strong runners up front. If they are healthy and fit, Tamalpa should be favored. Until Jan Frisby came down to California from the Rockies last year and broke the M70 10K record. Frisby is not running this year but the fellow whose record Frisby broke is. Hans Schmid leads the way for Tamalpa, aided by the consistently hard-running Len Goldman. The Pamakids and the West Valley Joggers should fight it out for the bronze medal. Tamalpa Runners, Atlanta Track Club, West Valley Joggers. Women’s 40+ Teams. Last year, Team Rogue’s Chris Kimbrough led her team to victory. But Kimbrough has moved on from Austin to Portland and leads Team Red Lizard this year. She had a strong supporting cast last year in Chris Henkiel, age group winner at the USATF 8K Road Championship earlier this year and Hall of Fame runner, Carmen Ayala-Troncoso. Although there are plenty of good runners on her team it does not appear that they rise to the level of Henkiel and Ayala-Troncoso. The 2nd and 3rd place teams are back intact. Bull City Track Club is led by Alexandra Bigelow who finished 7th last year. But equally important was their talented duo, Alison Klaitman and Nancy Kaiser who finished within a second of each other in 17th and 18th. The Atlanta Track Club, 3rd place finisher in 2014, is back with their team largely intact. Last year their two lead runners, Sonja Friend-Uhl and Holly Ortlund finished 2nd and 6th, but then there was a large gap. That may be their Achilles Heel again this year; there are so many talented runners who show up for this race, it is very tough to crack the top twenty. Another Club with a similar outcome last year is Club Northwest, led by Janet McDevitt and Gwen Lapham. McDevitt and Lapham finished 3rd and 4th but had a long wait for their next teammate. They have a different supporting cast this time so that may make the difference. The addition of Holly McIlvaine, who focuses on trail runs and longer road races, and Dyan Simon who finished 7th overall in this race when it was in Seattle, in 2011 should certainly help their cause. It looks like Club Northwest, Bull City, and Atlanta Track Club for the podium. Women’s 50+ Teams. Last year it was Athena Track Club, Club Northwest and Garmin Runners on the podium. Garmin did not make the west coast trip but the other two teams are here. Marisa Sutera Strange has been running stronger than ever this year but the 2nd runner from Athena, Doreen McCoubrie, who finished 2nd overall to Sterange last year, is not. McCoubrie has seen her training time diminish this year due to work and volunteer commitments. Julie Hankin, a strong runner in her own right, moves up from 3rd to 2nd runner for Athena. Still Athena is unlikely to claim the crown and may be pressed for 2nd place. Competition is that tight. Club Northwest looks to be the favorite. Alyssa Tower who finished 4th last year, is back, as are her two teammates, Kelly Kruell and Gail Hall, who finished 5 seconds apart in 11th and 12th. Can anyone else dislodge Athena? Athletics Boulder may be up to the task; they did not compete in Club Cross last year but they did run in their backyard at the USA Cross Country Championships. They took first there but did not run against any of the coastal teams, east or west. Noelle Green and Laura Bruess give them a chance for 2nd but it may come down, in the end to the team’s 3rd runners, Betsy Stewart for Athena and Delcia Litt for Athletics Boulder. The only other question is whether one of the other west coast teams is coming in under the radar. Does the Empire Runners Club, the Golden Valley Harriers, or the San Diego Track Club have what it takes to get on the podium? And what about the better known teams, the Jane’s Elite or the Impala Racing team? We will find out on Saturday. Club Northwest, Athletics Boulder, Athena Track Club. Women’s 60+ Teams. Last year the Genesee Valley Harriers, the Atlanta Track Club, and the Impala Racing teams finished 1-2-3. Genesee and Impala are returning largely intact but Atlanta has a whole new team. That’s unusual. Sharon Moore, Cindy Ingalls, and Carolyn Smith-Hanna finished 1st, 4th and 8th last year and should perform similarly this year. Jill Miller-Robinett and Jo Anne Rowland finished 3rd and 5th last year for Impala and both are back. Their 3rd runner is not but it looks like Mo Bartley, new to the age group will be a very able replacement and perhaps help them to move up. What about Atlanta? Last year they got 3rd by taking 2nd, 9th, and 12th. Do they have anyone this year to take the place of Mary Richards, their top runner from last year? Margaret Taylor is a strong runner but it does not appear anyone on the team this year is as strong as Richards. Taylor may be able to lead them to a 3rd place finish but there are West Coast contenders. 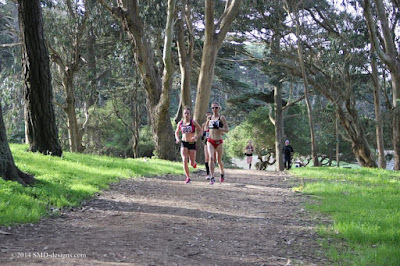 The Briones sisters, Carmen and Maria, will provide some firepower towards the front for the Lake Merritt Joggers & Striders, but I am not sure if they have a strong enough 3rd runner to compete for the last podium spot. The San Diego Track Club team looks a little more balanced. Genesee Valley Harriers, Impala racing Team, San Diego Track Club. Women’s 70+ Teams. The strong Playmakers Elite/New Balance team out of Lansing Michigan did not make the trip this year. Three West Coast clubs will battle for the championship. It is a tough one to handicap. Each team has exactly three runners so the third runner can often determine the outcome. Tamalpa Runners, San Diego Track Club, Cal Coast Track Club. Note: All places noted above refer to the finishing place in the Team Race, not necessarily the age group competition (which can include unattached runners and runners from incomplete teams). Age-Grade. The race recognizes an overall age-grade champion on the men’s and women’s side. Men. Last year, Joe Sheeran took the age grade on the men’s side with Peter Hammer and Pete Magill in hot pursuit. With Pete Magill not entered, I look for Tom Bernhard to move up; he has won a few age grade competitions this fall, reliably cresting 92%. Kristian Blaich could also be in the hunt; he has run strong all fall and seems poised for a great run. Being in the thick of the M40+ team battle will give him a little extra incentive. Women. Hall of Fame runner, Kathy Martin, ran away with this last year and should do the same this year. She topped 100% at the .US National Road Race a month ago. Marisa Sutera Strange has run well all year and regularly age grades above 90%. She should be on the podium as well. Chris Kimbrough would have to kick her game up a little higher to improve enough on her 7th place age-grade finish last year. Age Groups. The race is too big and my time budget too small to do justice to the age group races. Nonetheless I have listed the main contenders for each race. I will inevitably miss some who will place. The occasional surprise adds to the fun! M40. Gregory Mitchell took this group handily last year; after a gap there was a very tight race for 2nd through 4th between Alan Jackson, Alan Black, and Dave Slavinski. Slavinski is missing this year but Jacques Sallberg will join the fray. At the USA Cross Country Championships in February in Boulder CO, Sallberg surprised and upset the defending champion, Mitchell. The former Olympic Trials steeplechaser pulled away in the last loop to win by 15 seconds. A few weeks later Mitchell got even at the 8K Championship in Brea CA. 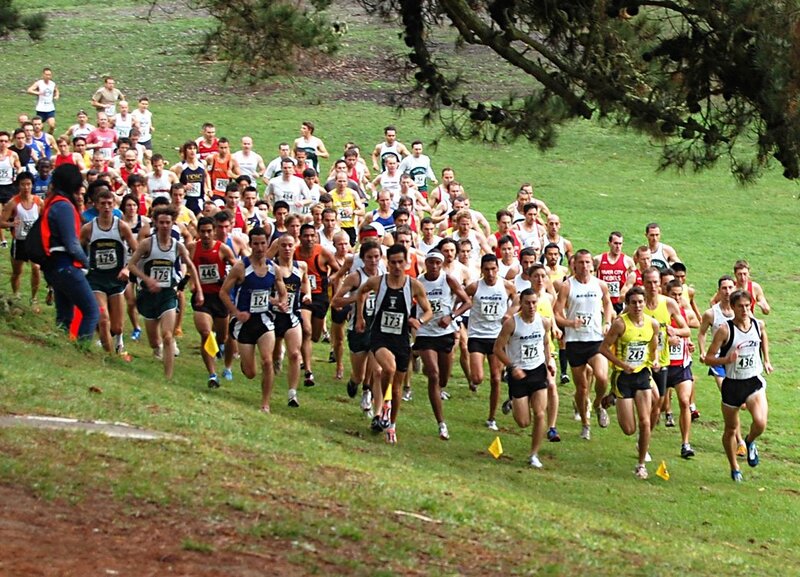 But this is their first meeting on the cross country course since that time. Who will come out on top this time? Mitchell, Sallberg, Jackson. M45. Chad Newton, Peter Hammer, and Kristian Blaich were at the top of this group last year and they are all back. But Jaime Heilpern, who finished in 8th last year in the M40 group, and is running on his home course, has moved up to this age group. Newton, Heilpern, Blake. M50. The only two runners back from last year’s top 6 are Eric Williams, 2nd, and Mike Nier, 6th. Mike McManus, who finished 8th last year in the M45 group, and Francis Burdett who finished 12th, have both moved up. Williams and McManus should battle for the top spot with Nier and Burdett having just as tight a battle for the 3rd podium position. McManus, Williams, Burdett. M55. Three of the top four from last year are back, Joe Sheeran, Michael Smith, and Ken Youngers. Youngers has had some injury problems this year that have slowed him down so he is a long shot for the podium. Dave Bussard has run very strong this fall, taking M55 wins at the 1 Mile, 5K, 15K and 12K road championships. He will give Smith and Sheeran a run for their money. And we should not count Jeffery Dundas out. Health problems kept him out of racing for a while but he showed at the .US National 12K that he has them licked or at least well under control. He finished 2nd to Bussard in Alexandria, a bit ahead of Youngers. Sheeran, Bussard, Smith. **Hot tip from a respected West Coast contact--Watch out for Dan King [Athletics Boulder] in the M55 to take it all. M60. Of the top 7 from last year, Chris Webber, first, and 4th through 6th, Paul Bazanchuck, Terry Permar, and John Tarkowski are all out. But Reno Stirrat, 2nd, and John Barbour, 7th return. Joining them is Mark Rybinski who finished 24th in M55 last year. More significantly they will be joined by Rick Becker and Tom Bernhard who did not make the trek east to compete in this event last year. Becker showed at the .US national 12K that a healthy Tom McCormack is still the only M60 runner who can beat him. Bernhard has had a superb fall of running but even he could not keep up with Becker. Becker, Bernhard, Stirrat. M65. Four of the top five from last year are entered but Lloyd Hansen will not run. That leaves it up to returners Doc Rappole, Jerry Learned, and Dixon Cook to battle for the podium positions. But it’s never that easy. Two top runners, Hall of Fame runner, Doug Bell and 2015 M65 Runner of the Year, William (Bill) Dixon, are also entered. Bell just moved up to the M65 age group this past month and looks to dominate. Dixon will have something to say about that; it should be a great race. Dixon rarely ventures this far away from his home base of New England so it is a rare treat. At the USATF 5K in October, Dixon came in 7 seconds ahead of Bell (in different age groups) so they are closely matched. Dixon, Bell, Rappole. M70. With newly minted Hall of Fame runner, Doug Goodhue out on rehab, Przemyslaw Nowicki and Len Goldman should battle for the title. Nowicki has been dominant in late fall, winning the USATF 15K and 12K titles by 4 seconds and 8 seconds respectively over Paul Carlin. But Carlin is staying in the Midwest so it is up to Goldman to give Nowicki a battle. At the beginning of the year Goldman was running really well and Nowicki was a little banged up. Goldman beat Nowicki handily in the Brea 8K. But Nowicki has come on strong this fall while Goldman’s times appear to have softened a bit. Nonetheless Goldman is on his home turf and has a team title to run for as well. It looks like the third spot could go to Frank White, Jr. who has had a strong autumn season of running, finishing 5th at the USATF 5K Championships in Syracuse and the .US National 12K. Goldman, Nowicki, White. M75. None of the top finishers from last year are back. Hans Schmid appears to be the favorite. The former American record holder of the M70 10K record, Schmid should be able to handle all comers on his home turf. Ron Mastin, the strong veteran runner out of Atlanta, should take 2nd. His 23:07 at the USATF 5K in Syracuse is impressive. Of course he also ran a half marathon on Thanksgiving. I hope there is no residual fatigue in his legs. Bob Lord should be able to get 3rd based on a 24:59 5K and 51:31 10K earlier this year. Schmid, Mastin, Lord. M80. The runners in this group last year were all East Coast runners who, not surprisingly, did not make the trip. So it is wide open for the four West Coast athletes who are entered. Bill Dodson has run a 26 minute 5K and a 1:05:07 12K so he gets the nod as favorite. But he will have a battle on his hands from Ralph Garfield who generally runs his 5K’s in 26 to 27 minutes but does have one just under 26. John Brennand will be keeping the pressure on as he is not far back with his 5K’s in around 27 minutes. Dodson, Garfield, Brennand. W40. All of the top 6 save one is back to do battle again and there is probably a newcomer who will be in the thick of things as well. Of those coming back, 2014 saw Sonja Friend-Uhl, Janet McDevitt, Jennifer St. Jean, Holly Ortlund, and Alexandra Bigelow finish in that order. Friend-Uhl took McDevitt’s measure by 10 seconds; most of the rest had 5-10 seconds between them but Ortlund and Bigelow finished 1 second apart. Friend-Uhl has continued to run well this year with a sub-17 minute 5K in her resume this year and a recent Masters win at a regional 10K in 36:10. She finished 2nd overall in the Masters race at the .US National 12K. McDevitt is also running strong, adding the USATF Masters 5K Cross Country title to her collection last month. St. Jean finished 4th in that same contest but was only 13 seconds back so no reason to count her out. The three of them should be going nip and tuck up front and should establish a gap on the others. Ortlund has run well this year with her 5K’s a little over or under 18 minutes. Bigelow ran a good 9.39 miles at the rerouted Cherry Blossom 10 mile run. But neither seems likely to crack the top 3. Friend-Uhl, McDevitt, St. Jean. W45. Chris Kimbrough is the heavy favorite to defend her title from 2014. Tania Fischer and Kirsten Leetch, teammates on the Jane’s Elite, who finished 2nd and 4th last year are back to try and chase Kimbrough down. That’s a tall order if Kimbrough is fit. As Kimbrough runs mostly on the trails or cross country it is hard to gauge current fitness. But she was the first masters athlete in at the recent USATF NW Region Cross Country Championships. Fischer is running well and took 3rd in the Southern California Cross Country Championships, with Leetch a bit further back than one might expect. It could have just been an off day or it could mean third is contestable. Kimbrough, Fischer, Leetch. W50. The defending champion, Marisa Sutera Strange, should certainly add this to her large and growing collection of national titles. She won by more than a minute last year and the 2nd and 3rd place winners are not in the race this year. And she has had an even better year on the roads in 2015 than 2014. Alyssa Tower, 4th last year, is back to contend for the podium but none of the other top runners are. Noelle Green, who finished third at the USA Cross Country Championships in Boulder CO is a contender. Strange, Tower, Green. W55. The top three runners from 2014 are back-Carmen Ayala-Troncoso, Kelly Kruell, and Gail Hall. Hall of Famer, Ayala-Troncoso, should have little trouble defending her title. She won by nearly two minutes last year. In October she took the USATF 5K road title at Syracuse in 19:14. Kruell and Hall, teammates on Club Northwest, finished 5 seconds apart in 2nd and 3rd respectively. Delcia Litt, who won this age group at the USA Cross Country Championships at Boulder in February, may give Kruell and Hall a run for their money. Ayala-Troncoso, Litt, Kruell. W60. Kathy Martin won this race last year by 2 and a half minutes. As long as she is injury-free there is no reason to bet against a similar margin this year. At the recent .US National 12K, martin age-graded over 100% in taking the age group title by more than 3 minutes. Hall of Famer, Martin, added another Runner of the Year accolade to her total this year. This is Martin’s last year in the W60 category at the Club Cross Championships; she would love to exit with a strong performance. Genesee Valley Harrier teammates, Sharon Moore, 2nd last year, and Cindy Ingalls, 6th, are back to contest for the podium. Newcomers Mo Bartley, and Carmen and Maria Briones, will contest the issue. Bartley has run two 5K races recently in 21:06 and 21:20. That gives her the edge over Moore who ran 22:04 at the USATF 5K Championships in Syracuse. Moore should have enough to hold off the Briones sisters who have run their 5K races in the 22:10 to 22:27 range but it will clearly be close. Martin, Bartley, Moore. W65. Jo Anne Rowland is the defending champion and she will be joined by Carolyn Smith-Hanna, moving up from the W60 ranks. They would be favored for 1-2 but there is a wild card. 2014 Runner of the Year, Sabra Harvey is entered. But will she run? Harvey broke the American 10 mile record for women 65-69 at the CRIM 10 Miler in August. Two months later she ran a terrific 15K at the USATF 15K championships on a very tough Tulsa Run course, age grading, despite the toughness of the course, at 96.06%, the only athlete, male or female, to crack 90% on that course on that windy day. But she was entered in the .US National Road Race two weeks later but did not show up for the race. Perhaps it was just fatigue but one worries that there may have been a flare up of an ankle injury she sustained earlier in the year. Harvey, Rowland, Smith-Hanna. W70. None of the top finishers from last year are back. Based on a quick review of the 2015 races of the entrants it appears that it will be a tight race between Laury Fisher and Manya Hult, both of whom seem to run 5K races in the 28 to 29 minute range. I give Fisher a bit of an edge because her best 5K is a little faster than Hult’s and Fisher also has a 55:46 10K to her credit. Edda Stickle has a 5K just over 30 minutes and that should be good enough that she can claim third in this field. Fisher, Hult, Stickle. W75. Only the 6th place finisher from last year, Madeline Bost has returned for this year’s competition. Katherine Singer has a 69 minute 10K and a 4.2 mile run in 42:09. The ability to maintain close to a 10 minute per mile pace for races that long makes her the favorite. Bost runs 11 – 12 minutes per mile for 5K. It is hard to compare Eve Pell who mostly runs cross country and trail races and has no recent road race times. Singer, Bost, Pell. W80. Last year there were no competitors entered in this division. This year there are two. I will make Lynne Hurrell the favorite on the basis of her 30:21 5K this year and her 43:43 time in a 4 mile race. Her rival, Jeanie Kayser-Jones ran a 29:11 5K at the BAA 5K in April 2014 but I can find nothing since. If she has maintained her fitness in the interim, or lost it and regained it, she should be the favorite. But the lack of recent races makes me a little dubious. Hurrell, Kayser-Jones. Best of Luck to all of the Athletes competing on the 12th! I really enjoyed reading this exciting preview of USATF Masters Club Cross Country Championships which was held in San Francisco some two years ago in 2015.